Powered by dual 18650 batteries (not included), the Charon Mini Mod can fire up to 225W, available in TC and VW modes, with a large high-definition 2.0 UI full screen, you can watch all the all the parameters clearly and easy to operate. 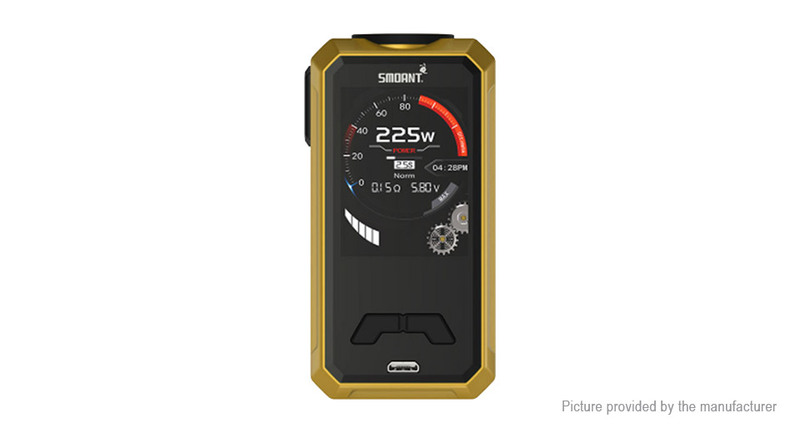 It utilizes the Ant225 chip with a faster response in only 0.015s when firing and has multiple automatic protections.This device has 2.0 inch TFT colorful screen, compared with other product it can offer you a clearer interface. Charon mini is designed ergonomically, which give you more comfortable hand-feel. It has 9 basic pictures to choose, you can download picture you like for user customizable wallpaper and standby screen. And Smoant Charon Mini supports firmware updating and charging by included USB cable. Besides, the minimum atomizer resistance allowed is 0.1 ohm. included USB cable to upgrade. Ergonomic design: Charon mini designed ergonomically, such compact size give you more comfortable hand-feel.